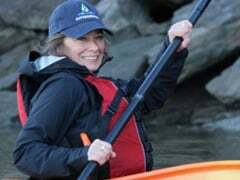 Gwendolyn Chambers became Riverkeeper’s Membership Communications Officer in 2005, working closely with the development department on fundraising materials and online membership relations. She is currently our website manager wrangling site projects as well as implementing marketing and promotional solutions. Ms. Chambers received her BFA in Illustration at the School of Visual Arts where she studied painting and graphic design. She worked as both a print designer and development associate at the Cathedral of St. John the Divine and later became the manager of Development Information. She has also worked for Space.com and freelanced for educational and environmental non-profits as a web designer.